Since forming late in 2015, Merseyside based five piece Weekend Wars have made impressive strides. From very early and continued support by BBC Merseyside Introducing (Dave Monks), the band have seen airplay from 6 Music (Steve Lamacq and 6 Music Recommends), Amazing Radio, BBC Radio Scotland (Billy Sloan), and the newly relaunched Virgin Radio (Jon Jackson), amongst a whole host of other specialist shows, stations and student radio. 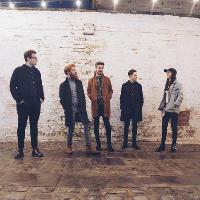 From performing at Liverpool Sound City, to recording their first interview and acoustic session with Dave Monks, BBC Merseyside Introducing, via being playlisted by (amongst others) Spotify Australia & New Zealand, the band continue to tour around the North West and add to their fanbase. Here are the latest Weekend Wars mixes uploaded to Soundcloud. Do you promote/manage Weekend Wars? Login to our free Promotion Centre to update these details.